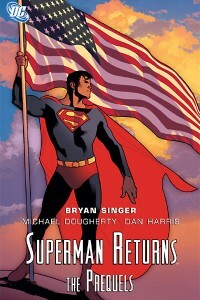 Five years ago Superman left Earth after astronomers discovered the location of Krypton’s remains. Upon his return, he finds a lot has changed during those long years (1980 to 2005 if you go by film production). In the build up to the film’s release they authorized 4 one shot issues that would act as prequels to the film. This trade collects them together. Luckily, these aren’t your run of the mill film tie-in comics – they’re actually well written and add depth to the characters from the film. ”Krypton to Earth” – The first issue covers the origin of Superman and the death of Krypton, with art by Ariel Olivetti and writing by the duo behind the current Jonah Hex publication, Justin Gray and Jimmy Palmiotti. You’d be excused for thinking this was money for old rope and to be honest you’d be mostly correct in thinking that. Remembering that the film origin of Superman is subtly different to the origin of our ongoing monthly Superman, this issue allows the reader to reacquaint themselves with the part of the multiverse they are venturing into. The writing of this issue is well done, though it suggests the scripting was an easy process. It’s respectful of the source material – unfortunately, nothing new is introduced. It has obviously been composed well though, with familiar lines being used to make scenes more poignant; for example the classic line of ”The son becomes the father, the father… the son”. 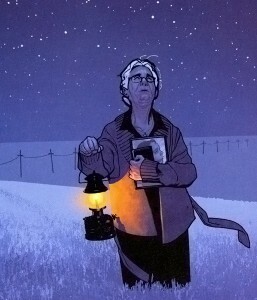 ”Ma Kent” – This issues covers Martha Kent’s isolation while Clark is off finding Krypton, with art by Karl Kerschl and written by Marc Andreyko. With Jonathan dead, and Clark in space, Martha has been left on the farm alone with only her memories and ghosts for company. The reader follows her through an average day in her life and at every corner she is haunted by memories gone by. She is waiting for him to come back to her, so chooses to endure these ghosts and writes postcards to Lois from Peru, signed from Clark. It’s such details which make this a well written story and, without a doubt, the best collected in this trade. The story really adds a real depth of humanity that the film was lacking. You get a feeling that Lois and Martha truly miss Clark/Superman. ”Lex Luthor” – The third installment of the prequels details how Lex became a free man again, with the art by Rick Leonardi and written by the same duo behind the first story. We join Luthor behind bars reminiscing over his previous run-ins with Superman. We then get to see him being released from jail. 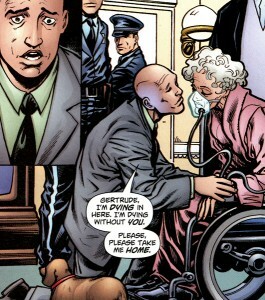 During this process we meet some of the other characters from the film’s rogues gallery, such as Kitty and Gertrude, the very wealthy old lady who Luthor uses to regain his wealth. It’s a nice little story filled with little ties to help link Superman 2 to the new film. My personal favourite parts of the story are the scenes he remembers from the previous films, which are quite a nice touch to add. I mean who can forget the attempted sinking of half of California? ”Lois Lane” – This follows Lois through the process of writing her ”Why the World Doesn’t Need Superman” piece, with art by Wellington Dias and written by Marc Andreyko. It has been 5 years since Superman disappeared and Perry White wants Lois to write a piece on why we still need Superman. She is not happy with the assignment, as she considers herself past Superman, but Perry insists. We then follow her motivating herself to writing about it, which includes having to talk herself into believing she still needs him. We soon see she hasn’t gotten past Superman and is angry at herself for this revelation. She decides writing the article will get him out of her life for good. The story also covers Lois’s life between the films and how she came to have a husband and child. Like the other Andreyko story in this trade it is very well written and adds far more emotional depth to the characters than the film ever did. My favourite panel is when Lois’s cigarette blows out. She thinks it is Superman, then realizes she is wrong and just holding onto the past. Overview – The artwork in this collection is surprisingly consistent despite being drawn by 4 different artists. Unfortunately, none of it is particularly special. The artwork is of a decent standard though; the only work that I dislike is in the ”Lex Luthor” issue, as it feels like a cheap copy of Tim Sale. I managed to get this on Amazon for only £0.01(+shipping), so I wasn’t going to be devastated if it did turn out to be yet another badly done film tie-in. Luckily for me, all four stories were well written, with two in particular really adding to the experience of the film. You will especially enjoy it if you love your original Superman films. ”You’ve got me? But… who’s got you?” moments of pure classic gold put into (good) comics for the first time. 4.5 out of 5 stars – A hidden gem. It is well worth picking up and giving a read, even if you didn’t like the film itself. I will warn that the actual film tie-in book is terrible unlike these prequels, so make sure you buy the correct tie-in. Clearly not essential to the film, otherwise they would have been included. However, the stories definitely add depth to the film as well as links between the previous ones. Watch: Superman Returns (2005). Don’t read the comic adaptation. Great pick for a review. It’s cool that you guys seem into exploring the lesser known collections. I’m sure we’ll have to review Watchmen or Batman: Year One at some point, but until then there are a lot of gaps out there. Even on the internet! definitely you are going to a famous blogger for those who are not already.